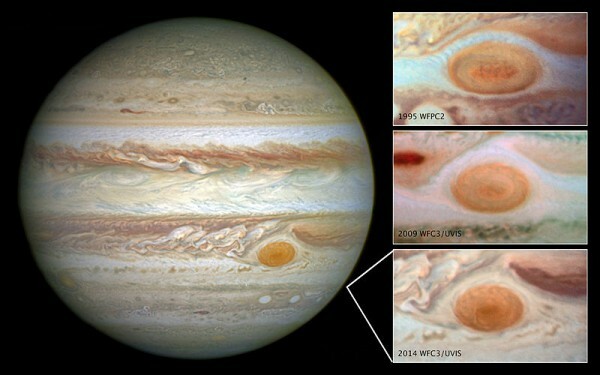 The Great Red Spot of Jupiter continues to shrink in size. This curious meteorological phenomenon that brings us accompanying lifetime (since it takes seeing Jupiter and was) apparently is declining alarmingly in size. The image, taken by Hubble and has been called “bacon strip of Jupiter” (for colors, come on) shows that while the Great Red Spot is still higher than the earth, its size has decreased dramatically. The red dot is an “evergreen” anticyclone in the south of Jupiter of at least 360 years old hemisphere. An anticyclone that, curiously and if Jupiter outside Earth, goes in the opposite direction that would be expected by winds and Coriolis, making it more “attractive” yet. Two or three times the size of Earth, is now very little more than a, well, that has decreased in 400 2/3 years (we know) and, although its size has never been fixed, has remained more or less constant . Although shaped egg is expected to end up being circulated by 2030 (more or less) and their shape is carried by winds that surround it (jetstreams, like those on earth, one in the northern hemisphere and one in the Southern Hemisphere that take advantage of aircraft to fly faster and spend less fuel). The different from the rest, red in principle due to the composition of gases that are moving attached to the lower gas. Dietary point are organic molecules (ammonia, carbon, normal …), a little red phosphorus sulfides (which are red, come on). So perhaps our generation see the demise of this famous spot, but still, watching the wind speeds in that area, there is no doubt that another exit “shortly”.